One hundred twenty five kilometers north of Munich lies the old medieval town of Regensburg, situated at the confluence of three rivers —the Danube, Naab and Regen. 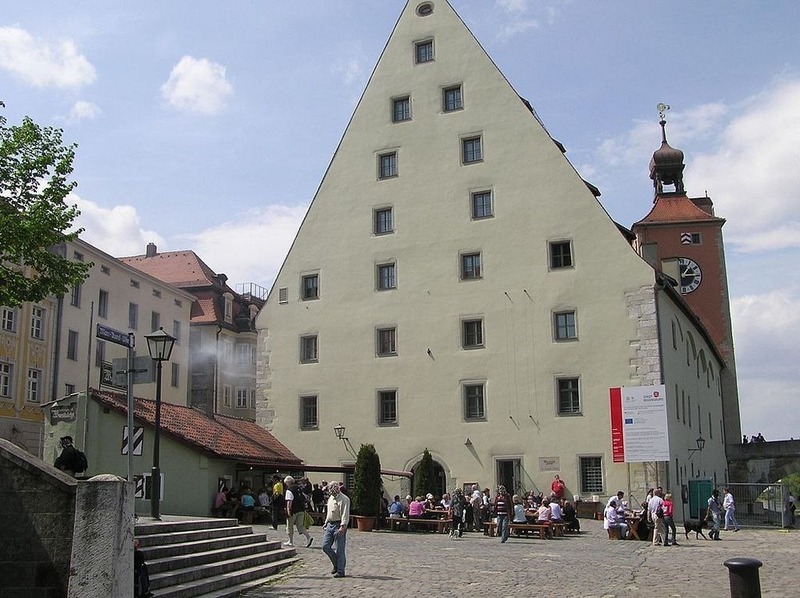 A UNESCO World Heritage Site, Regensburg is famous for its historic medieval center containing as many as fifteen hundred listed buildings, the largest such collection north of the Alps. 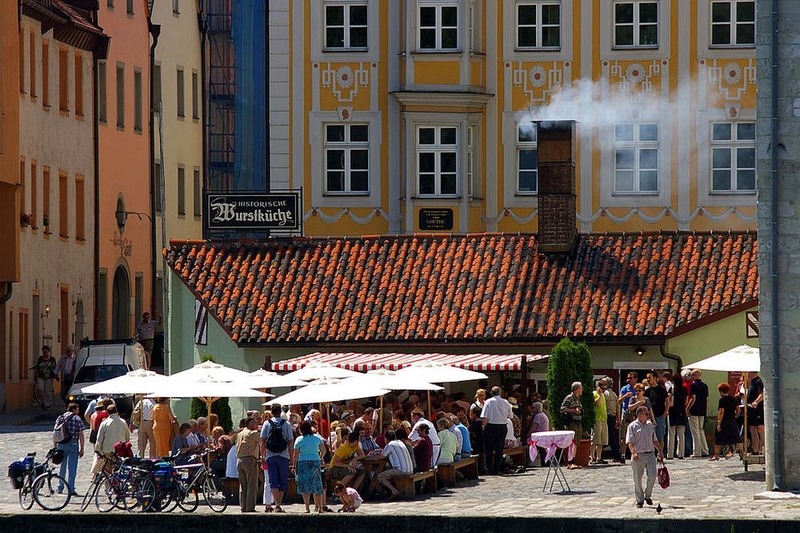 Among the most notable sights in town, is a 12th-century-old stone bridge over the Danube, and its contemporary and aptly titled “Historic Sausage Kitchen” that has been serving fine fried sausages to patrons for nearly 900 years. 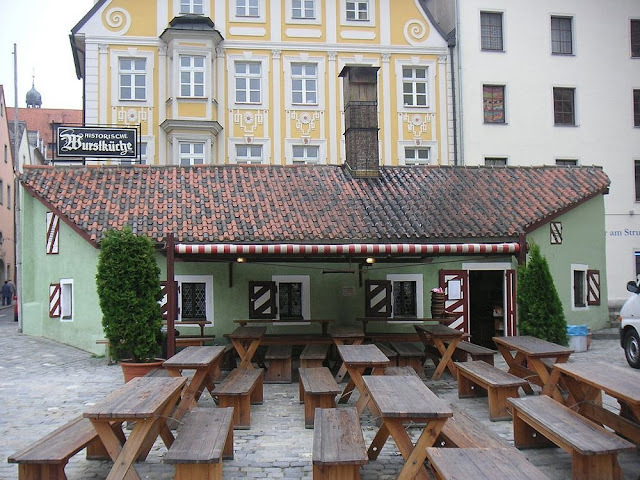 It is perhaps the oldest continuously open public restaurant in the world. The story of the “Historic Sausage Kitchen” (Historische Wurstküche in German) begins with the construction of the Stone Bridge in 1135. Prior to its construction, there was a wooden bridge across the Danube, about 100 meters east of the current bridge, but it was inadequate for the traffic and vulnerable to floods. So it was decided to replace the wooden bridge with a stone bridge. The Stone Bridge was built in eleven years, completing in 1146, and remained the only bridge across the river in Regensburg for more than 800 years. While the bridge was being built, a small building attached to the city wall served as the construction office. 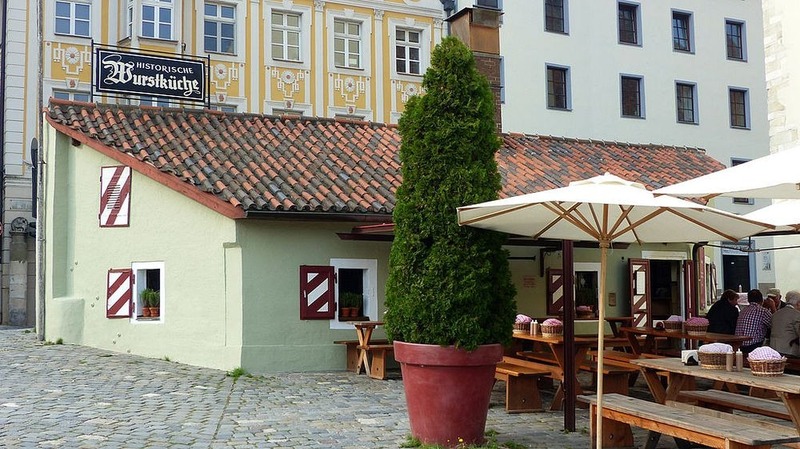 Once the bridge was completed, the office was closed and the building became a restaurant named "Garkueche auf dem Kranchen", literally, “food stall near the crane”, as it was situated near the then river port. For centuries, the tavern provided slow-simmered meat to dockers, sailors and the staff of the nearby St. Peter cathedral workshop. Exactly when the simmered meat was replaced by finer sausages is not known, but it’s believed that the transition happened towards the end of the 18th century or the early 19th century when the restaurant was taken over by a new owner. Charcoal grilled sausages served with rolls made with caraway seeds, home-made sauerkraut and mustard became the main dish which prevails to this day. As many as 6,000 sausages are served by the kitchen to guests every day. During the high tourist season in summer, additional wooden benches and tables are laid out in front of the tiny building. The “Historic Sausage Kitchen” currently occupies another building, not far from its original location. The place was shifted in the 17th century.